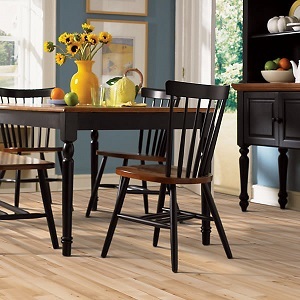 When shopping around for new hard wood flooring, the choices can seem a bit overwhelming. One of the biggest decisions in making your flooring purchase is whether to go with hardwood flooring or one of the many laminate flooring alternatives on the market today. The pros and cons of hardwood flooring vs laminate flooring can seem confusing. But by understanding the benefits and limitations of each, you can confidently make a flooring decision that’s right for you. Let’s start with a basic overview of hardwood flooring vs. laminate flooring. Hardwood flooring is available in both solid wood and engineered wood planks. Solid wood flooring is made from one solid piece of natural wood and is available in a variety of sizes and wood species. This means that the entire plank, which is typically ¾” thick, is made from one solid piece of lumber, making it 100% organic and a good eco-friendly option. Like the trees they came from ¾” solid wood planks are susceptible to the effects of moisture, which is why solid wood flooring is not recommended for humid areas or for installations over concrete slabs. Engineered wood flooring is actually constructed of several thin veneers that are secured together with glue and pressure. They are made available in a variety of wood species, plank widths and thicknesses. Engineered wood floors are much more dimensionally stable than sold wood floors and can be used throughout the home, whereas solid wood floors are only recommended for above-grade installations on approved wood subfloors. Most North American and European manufacturers of hardwood flooring follow strict industry standards to ensure that the wood flooring sold today contains no harmful volatile organic compound (VOC) emissions and uses glues that are formaldehyde free. Laminate is a multilayer man-made flooring designed to give the appearance of real wood. The surface layer is most often made from high-quality photographic paper with an image of wood, although some newer styles use a thin piece of real-wood veneer in place of the photographic layer. The core layer in laminate flooring is made of high-density fiber board, a wood product that is engineered using a variety of wood fibers belonging to the cardboard family. The backing layer, also known as the stabilizing layer, is made from melamine laminate and binds all of the other layers together. Then the surface layer is sealed with a resin-based coating for added durability. The high-end laminate floors offer tremendous realism in both texture and visual appearance. Many have beveled edges, textured graining, and come in various lengths. These floors can be floated over a variety of subfloors and used throughout the home. The finishes are extremely resistant to UV light fading, scratching, and scuffing, but may be susceptible to moisture just like a real wood floor. But on the better-grade laminate floors, the middle core and edges are sealed against moisture. The bonding of the composite material in laminates uses large amounts of glue. Cheaper glues can contain formaldehyde and other harmful materials, calling into question the toxicity level of this flooring. But there are many high-quality non-toxic laminate floors on the market. So it is important to ask questions as to the eco-friendliness of the product you are considering. In addition to eco-friendliness, there are four important areas to consider when weighing the pros and cons of hardwood flooring vs. laminate flooring: appearance, durability, maintenance, and price. The fact that no two planks of wood are exactly the same is what gives solid hardwood flooring its character and beauty. The rich grains, knots, and color variations within a wood species add texture and visual interest to the floor. Hardwood can also be stained to a variety of shades and colors, is available in varying gloss levels, and can include surface treatments like handscraping or distressing for more decorating options. Because laminate flooring typically uses a photographic image of real wood, it often falls short in capturing the true richness and uniqueness of real wood. Predesigned patterns imprinted on the surface of laminate flooring do imitate the look of wood texture, but often identical patterns are repeated, making it less authentic-looking. Some high-quality laminates do a better job of replicating the look of real wood, but it’s hard to avoid some repetition of patterns. Also, color and sheen level cannot be customized, so what you see is what you get. Aside from appearance, laminate flooring does not absorb sound well. And some find it to be a bit “noisier” to walk on than hardwood, as it produces a distinct hollow sound. Installing an acoustic underlay can significantly reduce this noise. When it comes to daily wear and tear, laminate flooring scores higher marks for durability than hardwood. The sealed wear layer protects the flooring from dents, stains, and smudges, making it a great option for hallways, entryways, and other high-traffic areas. Laminate flooring is also resistant to many outdoor elements such as sun exposure – a quality that makes laminate a popular option for sun rooms. While laminate is extremely durable, over time the wear layer will degrade and show scratches. This is one big drawback because laminate flooring cannot be refinished. So if the wear layer is damaged, the individual pieces affected will need replacing. Based on the quality of the material used and the thickness of the wear layer, on average you can expect to get about 10-20 years of use out of a laminate floor. In contrast, hardwood floors, which are easy to sand and refinish, can last a lifetime if well maintained. However, hardwood floors do require more maintenance to keep their original brilliance. Periodic top-coating or re-coating of worn areas may be necessary to add life to the floor. As mentioned, hardwood is much easier to damage than laminate. Drop a heavy object on hardwood, or walk across the floor in spike-heeled shoes, and you’ll likely see a dent. Drag a chair or table with metal feet across the floor or clean it with a vacuum that uses a wire brush, and scratches will surely result. Pets with sharp claws can also easily scratch the surface of hardwood floors. And keep in mind that natural elements such as sunlight will likely cause color changes in hardwood, and high humidity and moisture can cause damage from the boards swelling and expanding. So hardwood may not be the best choice for laundry rooms or rooms exposed to extreme temperature changes or outdoor elements. Let’s face it, new flooring, whether hardwood or laminate, can be a big investment. But it’s one that will surely add to the beauty and value of your home. Of the two options, hardwood is obviously the more pricey way to go, since it is made from harvested trees – and the more exotic the tree, the higher the price of the flooring. Hardwood is generally more expensive to install, especially when you factor in removal of the existing flooring and installation of a sub-floor, if needed. When you consider the life expectancy of hardwood vs. laminate, it can definitely be worth the money. Looking to add resale value? Keep in mind that while laminate flooring will increase a home’s value compared to other flooring options like carpeting, hardwood floors are generally more sought after by home buyers. Comparatively, laminates are a much cheaper option. And installation typically costs much less than hardwood, since the flooring can be placed on top of almost any existing hard floor surface. And with the many glue-free tongue-and-groove options, installation is easy, especially for do-it-yourselfers. In the end, when it comes to hardwood vs. laminate flooring, many factors will determine your final decision. But having all the facts will help ensure a flooring choice that meets your budget and needs while truly reflecting your decorating style.